The Norse settlers in the Sudreys have enjoyed good times for a few years. But change is in the air. 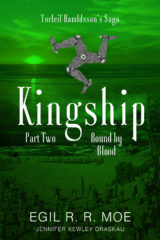 In a dramatic shipwreck, the king, the queen, the bishops and the flower of the nobility all lose their lives. The island kingdom finds itself all at once without government or leaders. 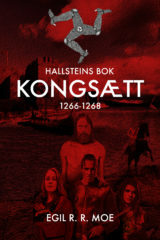 Young Torleif is thrown into a conflict he is ill-prepared for. 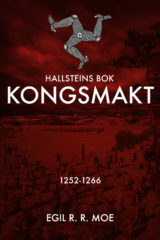 His father’s overweening ambition thrusts the clan into a bloody feud. Torleif needs to dig deep to find the courage to face his enemies sword in hand, but he has no weapon against his father’s hatred. 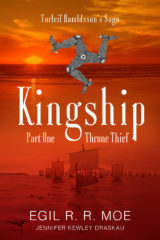 Life on the islet of Rushen is proving a trial for Torleif. 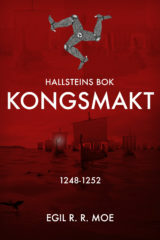 He is oppressed by his father’s lust for power, and the people of Man resent Harald’s influence over his son. 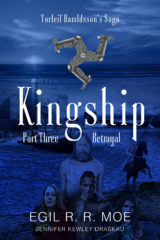 They demand their rights, as they have done so many times before throughout history, and this time it is Torleif’s uncle, Ivar, who must step into the breach when the Manx rebel. 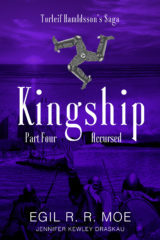 Will he oppose his brother and nephew and strip them of power, taking the throne for himself? Fenella, meanwhile, continues to fight desperately to win the birthright for her sons. Luckily, her knowledge of herbs and healing is unequaled. She does her best to influence Torleif to acknowledge her sons, but will her strategy succeed before he gets Magnhild with child? Alexander, King of Scots, has not forgotten his plans to seized power over the Sudreys. 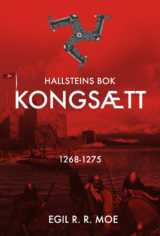 At last, he manages to persuade the King of Norway, Magnus Haakonsson, to sell him the kingdom for a pittance, but will this prove acceptable to the Norwegian settlers and the Manx, or will it lead to conflict?